Log splitters really do make life easier on the body and are a tool often used to source heat for the entire home. While being the fastest way to split logs, they have one pitfall. T he only downside to a wood splitter is that many models aren’t very easy to transport. Being large and not to mention heavy machines, we thought its time to find out what are the best portable log splitters in 2017. While having a log splitter takes the back pain out of splitting logs, they can be difficult to actually to transport. So in turn it can cause other related pain if you need to split some logs away from home. Ever tried lifting a 25 ton beast?. It aint pretty, nor is it light. But for some folks, firewood needs to be on the go. So splitting wood can be done across many areas of the Country. For this to be achievable, a high quality portable log splitter is a must. So when the time comes to pack up your gear and start splitting be sure you go through our buyers guide here that we spent countless hours researching and testing a variety of different log splitters to come up with a top 3 list of the best portable log splitters on the market in 2017. There are two main ways for a wood splitter to be a portable. One is it has to be a fairly small so you can store it easily, or put it in your trunk or on the back of your truck. The next and most common way is by having a tow hitch, which will make life a whole lot easier by making it possible to tow your splitter around your back yard or around town. Compatible with many ride on mowers and tractors as well, these machines take the hard out of work. 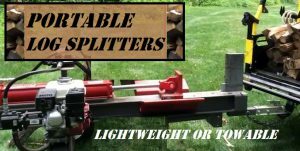 So with those two ways in my mind I began setting out to find just what are the best log splitters that are easy to transport around. 1.1 The Ever Portable Champion 25 Ton Machine! 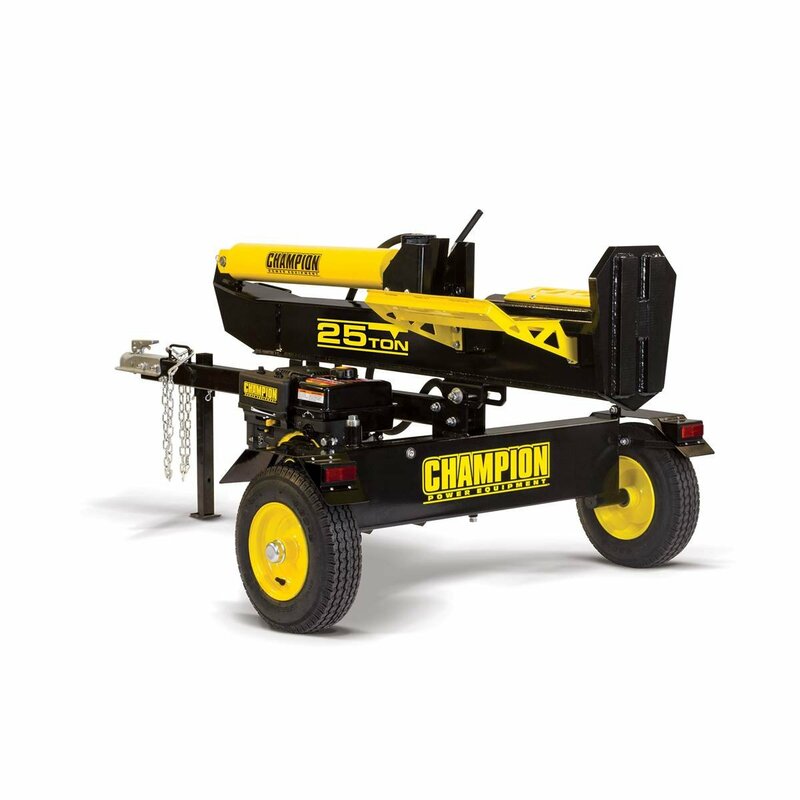 The Ever Portable Champion 25 Ton Machine! Over the past few years I have used many types of splitters and the one brand that keeps impressing me time and time again is Champion. In particular the 25 ton log splitter. Rated one of our best towable log splitters, this beast is sure to impress. When it comes to the portability of this Champion beast, it has a 2 inch ball coupler with an extended tongue which is perfect for atvs and utvs. It also has Department of transportation approved tires so it can travel up to 45 mph without any concern. However I wouldn’t recommend going to fast with any splitter attached to the back. They are simply too valuable to lose going around a corner too fast. A word of warning tho, is this log splitter doesn’t have taillights so towing it at night might be illegal in your state. Once you have taken this wood splitter to the location you need to start splitting wood, just what can this splitter do? There isn’t much this champion can’t get through, which is why I can’t get enough of this machine. I found that the Champion can easily split logs that are 30 inches in diameter and just over 20 inches in length while in its horizontal position. While trying to split such large logs in this position it may require you start from the edges and split inwards. 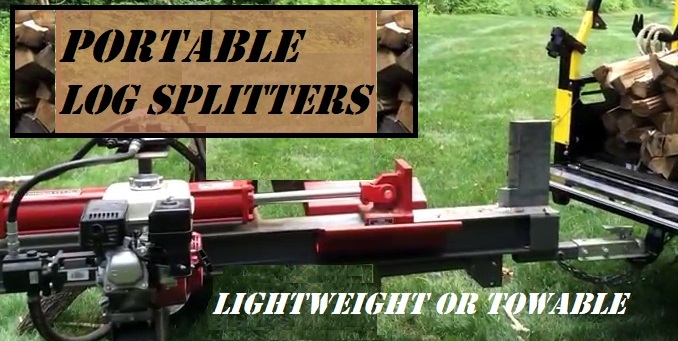 If you really want to split larger logs with the possibility of splitting logs that are 38 inches in diameter, you can put this splitter into its vertical position. With the ability to go into a a vertical position it makes splitting logs that are larger, but also heavier so you don’t have to pick the log up off the ground. To put it into a vertical position it has a removable pin, so it’s as simple as removing the pin and move the splitter into a vertical position and then putting the pin back in. Lastly, I love how heavy duty these tires are. Often an overlooked feature of a log splitter, but having a good set of wheels is not only going to look good. But provide you with a much easier to move machine that is built to last. 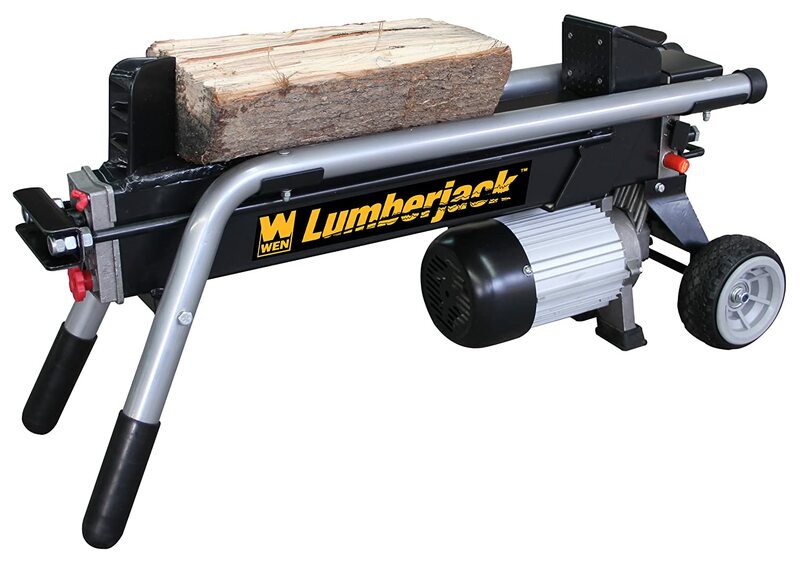 This WEN 56206 6 ton electric log splitter is a surprisingly lightweight and portable machine. Truth be told, it’s very impressive for such a small machine. With its simple design it only weighs in at 100 pounds which makes it one of the lightest electric wood splitters on the market. Being such a small machine it makes it perfect for people who don’t have a lot of space, while also being small enough to store away and not be in your way. This WEN also has two rubber handles which make it easier to grip for when you need to move it around your house, or when your outside. It feels nice in the hand so you can comfortably carry it anywhere. It won’t rip your hands to bits is what I’m getting at. 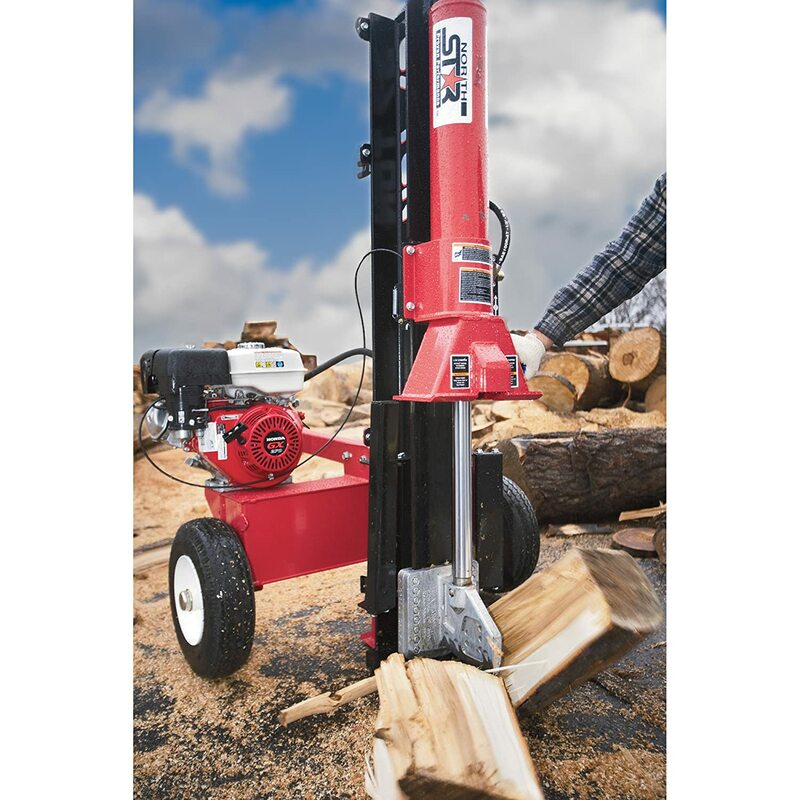 One of the real big advantages the WEN wood splitter has is that it has an electric motor. This is becasue it is not gas operated like many of the bigger machines. So it doesn’t cause any fumes, and since it doesn’t have any fumes it means you can split logs from inside the comfort of your home. Since it is an electric wood splitter you would be right if you were concerned about the current it uses, I’m happy to report that this electric log splitter uses the standard household current. You will find you don’t have to worry about such things like cold starts and since it doesn’t require gas you don’t have to worry about not having any gas or running out. The downside to being an electric log splitter is that it doesn’t have the power of a gas powered wood splitter, so while you have some great advantages that is one of the biggest draw backs. So you won’t be splitting 20 inch plus logs with this splitter, but you can still split logs that are about 16 inches in diameter. As with all splitter if you do try to split logs that are to big for it, I find it best to start on the outside and work my way in, a basic thing for using a log splitter. The NorthStar 37 ton log splitter has only recently come to my attention and boy do I wish I found this beast of a splitter earlier. It is one of the best vertical wood splitters I’ve come across. As with the Champion up above, the NorthStar also has a 2 inch ball coupler which I feel needs to be on every splitter that is to heavy to move by yourself. This is a very heavy piece of machinery weighing in at over 600 pounds which is about 200 pounds more then the champion, so you may require something with a bit more grunt to tow it. The NorthStar also has the downside of having no taillights so it may be illegal to tow at night in your state, so that is something to also think about. I’m someone who loves having tools that are over kill for the job. I like not having to worry about if my machinery or tool is going to be strong enough to get through the job. So when it comes to splitting logs I live by that rule, which makes the NorthStar perfect for someone like me. This beast of a machine will split practical anything you throw at it. While in its vertical position I was easily able to split logs that were 40 inches in diameter, with that kind splitting power it will turn a three day job into a one day job. With this splitter you will easily be able to split 10 cords a year, so it is designed for people who rely heavily on wood. One thing some people require when looking for a log wood splitter is the type of engine does it have, and is the engine a Honda? The NorthStar thankfully does have a Honda GX270 engine, which is one of the most reliable engines I’ve ever had the pleasure of operation. With the Honda engine you won’t have to worry about this splitter starting up on either the first or second attempt. If your after a transportable log splitter with some serious grunt, I highly encourage you to check out the NorthStar.